As some of you may know we just took off on a 2-week long road trip through cold states like Wyoming and through warmer states like Nevada and California. Since the KonMari Method was such a huge success in our closet, Tom and I both wanted to use the same folding technique to pack our suitcases. 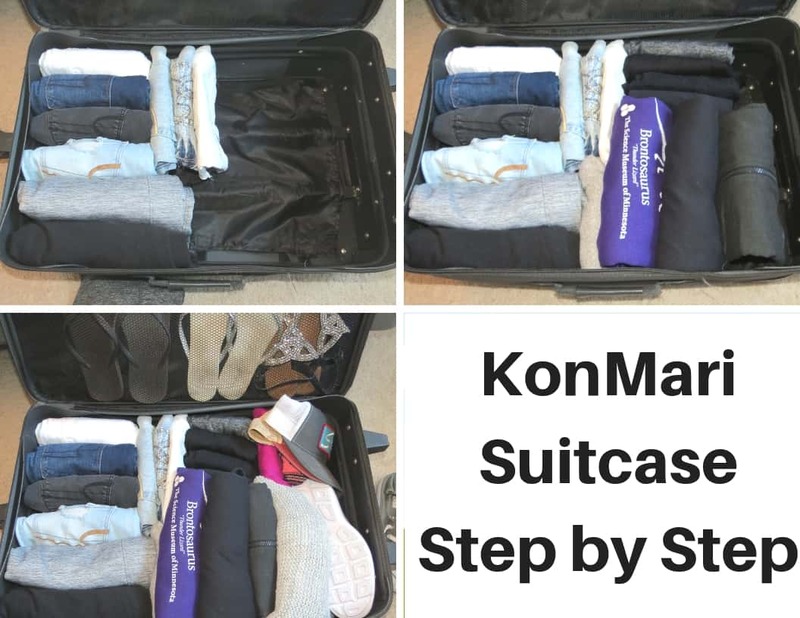 Check out my KonMari Method suitcase for 2 weeks worth of clothes and get the update on how it went after the trip ended! *This post contains affiliate links. I may make a commission on reccommendations at no cost to you. My basic plan for packing my suitcase was to do big items first like sweatpants, sweatshirts and pants. In the extra space, I would tuck in shirts and dresses. On the top, I would just the KonMari folding method for smaller shirts like tank tops to fill the top of my suitcase. Here is a quick shot by shot of the KonMari folding method for pants. Like I said, we were going to be traveling through colder states, so I wanted to make sure I had the appropriate gear to wear during colder weather. In order to pack my suitcase thoroughly I would put these bulkier shirts in next to my pants on the bottom of my suitcase. Ever wondered how to fold a hoodie using the KonMari folding method? I’ve got that quick guide for you here too! Once you have all of your big items folded, you neatly arrange them into the bottom layer of your suitcase. This helps ensure all of your bulky items fit in and help create a sturdy foundation for your suitcase. From here, you can see I left enough open space on the side to tuck in my running shoes and still have open space to fit my flip flops. Check out the full video here to see how I fit my shoes in. From here you can nicely fold your smaller and more delicate items to nicely lay across the top. The downside I found when packing my suitcase was that I was not able have my shirts “stand on their own” like Marie Kondo does. Because suitcase space is limited, I laid them flat, but the KonMari folding method still helped create a ton of space in the suitcase. I know, I’m crazy photogenic. Don’t be jealous. So, after 2 weeks on the road, 2 Airbnbs, 3 hotels and one week long stay in Cali did the KonMari method hold up? Getting to items I wanted to wear was super easy. It was easy to quickly re-pack and get back on the road. I fit a ton of outfits into here and was able to accommodate all weather changes. Some thinner shirts did get wrinkled (I use a hair straightener to “iron” these wrinkles while traveling. That is really about all the bad things I can think of. After asking Tom he said the same thing. He felt it kept his clothes more organized, he liked that he knew what he was getting and it was easier to re-pack! All in all, I’d have to say the KonMari Method suitcase is the way to go! Want to stay up to date with our travels? Make sure to follow along on YouTube for our travel videos, budget tips and minimalist lifestyle ideas. AirBNB – Get $40 off your AirBNB stay by using my link and take advantage of the many affordable places to stay around the world. Car Rental Booking Buddy – Get the best quotes on rental cars starting at only $8! Browse cars now! Restaurant.com – Get a $25 gift card for only $10 at local restaurants!